One of my favorite meals while I was growing up was savory Chinese pancake wraps (面饼) that my dad would make for us for dinner. It was one of the few things my dad liked to cook, and I remember him showing me how to make the batter and cook the pancakes on multiple occasions. An interesting tidbit about my dad: he never cooks except on rare occasions, but it was he that taught my mom how to cook after they got married! So everything my mom makes is really from my dad’s expertise, yet he never cooks around the house anymore. How oddball haha. Anyway, Chinese pancakes are somewhat similar to crepes, except they are a bit thicker. The batter is very simple, made with just flour and water, along with some salt and sugar for a little bit of flavor. But for the most part, the flavor comes from the filling that you wrap into the pancakes – savory sauces and meats and crunchy vegetables. It’s a lot like eating Peking duck rolls, except the wrap isn’t dry like a tortilla. 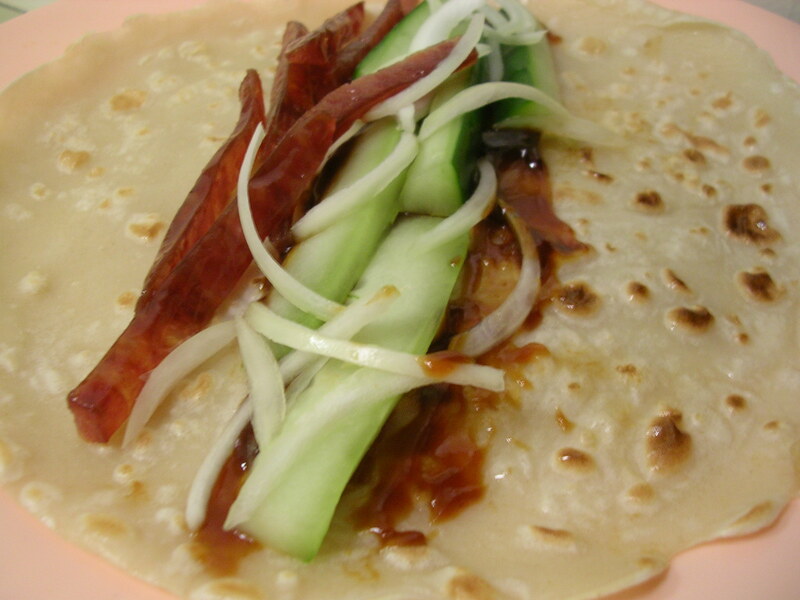 In my family, we make these pancake wraps for an easy dinner, and serve them with hot congee (rice porridge) on the side. We usually spread hoisin sauce on the pancakes, and then wrap in whatever meat that we feel like that day (often times we use pork sung, but also sometimes turkey ham or bologna… it really doesn’t matter). 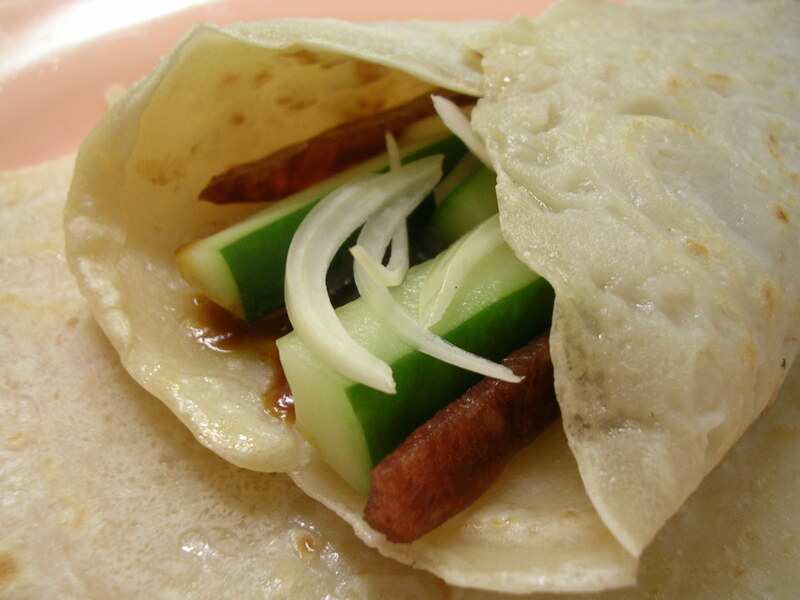 For the pancakes I made last night, I seared up some Chinese sausage for the meat filling, and cut up fresh cucumbers and onions for the vegetable. I really liked the refreshing crunch from the veggies and the Chinese sausage is so delicious and savory it rounds out the whole wrap. 1. Place flour in a bowl, and make a small well in the middle. Pour in water all at once and stir quickly to dissolve flour. The batter should be liquid but slightly thick, like a cold heavy cream. Add water as necessary to get the right consistency. Try to minimize the number of lumps by crushing them to release the flour inside. Stir in salt and sugar. 3. Cook pancake until the topside has lost most of its raw white color, and bottom is starting to just get a little bit golden in a few spots. Flip pancake and cook for a minute more – the bottom should have a bunch of round spots browning (see picture below for what the spots look like on the pancake). Flip again and cook the first side for another minute. Repeat with rest of the batter. 4. Slice up the Chinese sausage into short strips, and toss around in a clean skillet for a few minutes on medium heat until they start to release their oils and darken slightly in color. Slice the cucumber and onions into small strips as well, and place all the filling ingredients in separate plates for serving. Feel free to scale the recipe however you’d like – you can make your pancakes bigger or small depending on what you want. It’s very versatile, and you don’t have to follow the proportions exactly, as long as you have a satisfactory consistency. Just be sure to take a test nibble from a pancake after you make it, to make sure you’ve cooked it long enough, otherwise they will have a slightly sticky texture from being undercooked. These pancakes are a great way to switch things up and they’re fast to make. Enjoy! This entry was posted on Sunday, March 23rd, 2008 at 6:27 pm	and posted in Chinese, cooking, recipes, Uncategorized. You can follow any responses to this entry through the RSS 2.0 feed.